Having an internet connection is key for communication these days. However, natural disasters can disrupt existing internet connection and many places don’t have reliable and wide-spread internet coverage to begin with. Furthermore, some people simply cannot afford to connect to the internet. As mentioned, there are many different use cases and, therefore, stakeholders for this technology. Across the board, developers are the key stakeholders as they need to use Bridgefy’s SDK to build or update their apps. Next, users of apps that include Bridgefy’s functionality need to be made aware of the mesh network functionality so that they use the relevant apps, enable Bluetooth, and allow the network to form. Depending on the type of app the specific stakeholders will vary, but this could include civilians/individuals, government officials, hospital employees, etc. Early deployment has to focus on a) making sure the technology works seamlessly from a technical perspective and b) creating a large enough mesh network for the technology to work from a practical perspective. This platooning technology has implications beyond the trucking industry. These connected vehicles also collect data on the road and traffic conditions that can be shared with other connected cars and the government to improve safety and traffic more generally. The textile industry produces a lot of leather. The production of leather is extremely resource-intensive (water, land, food, fuel) and produces large amounts of waste, including toxic chemicals used in tanning. Faux leather (e.g., made from PVC) is another prevalent material and is not a sustainable material either as its production and disposal release a lot of toxic materials into the environment. Piñatex is currently only distributed in a brand-to-brand (B2B) format. Therefore, the key stakeholders are companies that currently design products with leather or faux leather. Specifically, design teams would need to learn about the material and design with this material in mind. End customers are another stakeholder as they could drive demand for this material, asking companies to include this material in their collections in the future. Proactively send samples to key companies that design with leather and/or faux leather and have sustainability goals, e.g., Eileen Fisher (fashion), Veja (shoes), Matt and Nat (bags), Tesla (car seats), etc. The article also discusses how this sensor-based crossing is envisioned to be integrated into the road. A responsive, sensor-based surface made of steel would be integrated under the regular road surface. On the top of these two layers of the road would be the LED lights, covered in a high-impact plastic to prevent damage from vehicles and weather. The amount of carbon dioxide (CO2) in the atmosphere has been rising rapidly. After five years of growth rates exceeding 2 parts per million (ppm), the atmosphere now contains over 400 ppm of CO2. This explosive growth makes it decreasingly likely that climate change targets can be met. The key stakeholders for the nanoCO2 harvesters would be industrial facilities managers. They would have to be convinced that using these nanomaterials is superior to using current pollution management processes and to switch over to this new technology. Regulators are also stakeholders because they need to understand how this material behaves and affects the environment and health. If the material is safe, they could work on making the use of this material mandatory for the production of certain materials. With e-commerce on the rise, the number of goods that get returned by customers is an increasing problem — for e-commerce return rates are ~10-20%. The problem is not just that the retailers incur vast financial losses but also are responsible for substantial amounts of waste and a large carbon footprint from inefficient transportation with multiple touch points. The process of taking back returned products (a process called reverse logistics) has traditionally been unsophisticated and even today, the aggregate goods returned result in 4 B pounds of waste going to the landfill and 11 M metric tons of carbon emissions entering the atmosphere. On the one hand, the technology would be used by retailers. The logistics departments of retailers would have to adopt the reverse logistics management system so that returned and overstock goods go directly to Optoro’s warehouse. On the other hand, end customers would also be stakeholders for the system because many of the goods end up being sold through discount-goods websites also run by Optoro. Making customers aware of these options will also be valuable to the success of the technology and company. The sustainable highway is also supposed to improve the response to accidents using autonomous drones flying over the highways. I wonder at what scale and thus cost you’d have to deploy these drones for them to make responses to accidents quicker than they already are. The lack of access to essential medical products is an important health and sustainability issue. Many people, especially those living in countries with less developed infrastructure, struggle to receive the health supplies they need, whether that’s blood, vaccines, or medication. Over 5 million children die per year because of this (http://www.bbc.com/news/technology-40935773). The technology’s main stakeholders are health professionals like doctors and medical staff. They will be the ones to order the medical supplies, which they can do through their mobile phones. 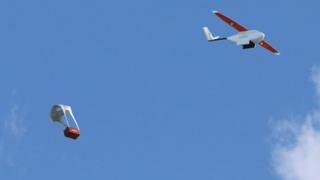 The drone will then drop the supplies off right at their facilities. Another stakeholder is the government of the countries in which Zipline operates because the company needs favorable drone regulation to operate and is trying to get the government to pay for deliveries. This technology has already been deployed in one country (Rwanda). The deployment strategy will focus on deploying it in other countries. The fashion industry, especially the fast fashion segment of the industry, widely uses nylon (6 million tons/year). Nylon production is highly unsustainable as it’s a very energy-intensive process based on petroleum. In fact, nylon scores worse on the Higg Materials Sustainability Index than 79% of other fabric types. With growing demand for nylon, there’s a need to reduce the negative impacts nylon production has on the environment. There are two main “users” for this technology. At the production level, textile manufacturers would be the ones to use this technology, as they’d create the solar nylon out of its raw materials at their facilities. High-level manufacturing managers at these manufacturing facilities would have to be won over to integrate this technology, but manufacturing workers would be the ones to actually use the technology. Additionally, buyers of nylon (e.g., apparel companies) would also be users of this technology. The design team of such a company would have to know about the textile to design their products with this fabric in mind, the sourcing team would have to procure this textile, and then their manufacturing facilities would actually create the products out of the solar nylon. The deployment strategy depends on whether the creators of the technology want to sell the technology to existing nylon producers or set up their own company to produce the solar nylon themselves and sell to buyers directly. For the former strategy, they’d need to take the following steps.